Disclaimer: Please note that this case was prepared by Sunil Chhabra, Alyssa Kaplan, Paul Mathulla and Gary Schanman as the basis for class discussion rather than to illustrate either effective or ineffective handling of a business situation. Ed Colligan, VP of Marketing for the Palm Computing subsidiary of US Robotics, sat back in his chair with a smile after reviewing the latest sales figures for the PalmPilot&trade;, personal digital assistant. The past two years had been a swift ride up and things looked great. Selling almost 1,000,000 units in its first year, the launch of the PalmPilot&trade; was being heralded as one of the most successful consumer electronic launches in history. Opportunities were everywhere. Over 3,000 software developers had shown interest in writing software for the PalmPilot&trade;, the product was flying off the retail store shelves in full distribution, and IBM had made plans to pay a per-unit fee to use Palm Computing's standard for an OEM line of WorkPads to be bundled with IBM ThinkPad PC sales. But the market was just beginning to grow, standards were still undetermined and Microsoft, the largest software company in the world was entering the market with a competitive system that could threaten Palm's position. Colligan wondered what steps or changes, if any, were needed to sustain its market leadership position. As miniaturization technology had progressed, computers were continuing to get smaller while keeping much of the same functionality as their larger predecessors. First there were mainframes; then came desktop PCs followed by laptop/ portable computers. The next phase in computing had arrived: the palmtop or hand held computer. Beginning in the mid-1990's the hand-held or palmtop computer and the Personal Digital Assistant (PDA) were vying to dominate the market place. The palmtops and the PDAs were similar in terms of portability but very different in their functionality. Palmtops were pocketsize computers that approached the full functionality of a desktop or laptop PC. On the other hand, PDAs were positioned as a more intelligent and more capable organizer. It was viewed as a computer accessory that had limited but relevant applications for short trips or meetings away from the office. Technology continued to evolve. Conservative estimates put the potential market for hand-held computers to be as much as $7.2 billion in 1995. In 1991, Jeff Hawkins developed PalmPrint&trade; technology, a handwriting recognition computer program that could be used in portable, pen-based computer devices while working at GriD Systems, a subsidiary of Tandy Corporation. Although first developed for business use, Hawkins soon redirected his efforts on developing a personal computing device or Personal Digital Assistant (PDA). His interest came from the consistent feedback from GriD sales representatives citing the large potential consumer market for hand-held devices. However, when GriD/Tandy did not want to give Hawkins adequate control of the project, he began to consider venturing out on his own. After obtaining a patent on the software algorithm and some venture capital funding, Hawkins founded Palm Computing in 1992. Palm Computing's first intention was to develop software and services (including their handwriting technology, now called "Graffiti") for other companies' handheld operating systems. Companies such as Geoworks, Apple Computer, and General Magic were to provide the main architecture, hardware, operating system and marketing for their units. In the end, of these initial partners, Palm's handwriting recognition software was only used in the Zoomer product co-developed by Palm, Casio, Tandy and Geoworks. In addition, disappointing sales for the initial generation of products (particularly the Apple Newton) caused industry support to vanish. Palm Computing was left with little financial support and no partners. Although most believed that the market for PDAs would eventually take-off, the Newton's failure made firms reluctant to gamble on developing new hardware systems. have "set the category back a couple of years." In 1989, Apple Computer CEO, Jon Sculley, a former marketing wizard at Pepsi, was looking for the "next greatest thing" to leave a successful mark on Apple. After being exposed to basic PDA technology, he was taken with its market potential and began his push to develop the "Newton". According to multiple sources, Sculley was obsessed with the Newton. The promise was to have a mini-computer in one's back pocket, with all the functionality and connectivity that a mobile computer would provide. The added benefit was its size and its ability to be used as a notepad, with a customized pen-like stylus that could be used to write notes. The key breakthrough feature of this unit was its handwriting recognition software which Apple claimed could be customized to fit the users' own handwriting style. Initial public press demonstrations of primitive prototypes were used even before the designs and specifications had been approved. Based on such high expectations, the market was holding its breath to see what Newton would bring to the computer world. Product development did not go as seamlessly as planned. There was tension between the old Apple technology ranks, who felt that Sculley did not have ample understanding of the realistic potential of the technology, and Sculley. Public promises, technological difficulties and a tight timeline all put undue stress on the team. In fact, the core development group had one suicide and one member put in jail for assault during a nervous breakdown. The Newton, originally scheduled for an early-1992 release, was not launched until mid-1993. Upon the Newton 100 model launch, it became apparent that the product did not deliver what it promised. For one, basic functionality suffered. The Newton's highly touted handwriting recognition software was faulty when it first arrived. It was not uncommon to hear jokes about how poorly it interpreted people's handwriting. The high cost (+$1,000) of the Newton seemed relatively steep given this major flaw. Apple clearly sacrificed product performance in order to rush to the market. Due to the backlash, Newton was estimated to have sold fewer than 100,000 units during the first year after receiving several million dollars in marketing support. Over 30,000 of the original Newton 100 models were sent to the landfills. Meanwhile, by 1995, Hawkins and Palm Computing CEO, Donna Dubinsky, were running out of time and money. A breakthrough was required quickly if the firm were to remain viable. With the last pennies of its venture funding, Palm Computing developed a functional prototype (and created a proprietary operating system with its own architecture) and began beta testing as it tried to generate the interest of a number of manufacturing partners. Palm Computing was desperate. Then, one day Jeff Hawkins and Ed Colligan met with Jon Zakin, Executive VP of Business Development at US Robotics to explore partnering opportunities. After seeing the prototype demonstration of their product; the PalmPilot&trade;, Zakin immediately committed to building a modem for it and expressed some interest in additional investments. The next day, in a surprise move, Zakin placed a call to CEO Dubinsky, offering to buy Palm Computing and their PalmPilot&trade;. A week later a secret meeting was arranged to negotiate the terms and conditions of the arrangement and within a month and a half the deal was done. in the remote access market." US Robotics was founded with $200, in 1976, by Casey Cowell and two college friends from the University of Chicago after they invented an acoustic coupler. The acoustic coupler was the predecessor of the modem, the hardware used to connect mobile computers to networks through the telephone lines as well as link Local Area Networks (LANs). Located in Skokie, Ill., a small suburb of Chicago, US Robotics (its name was taken from the name of a company from the Isaac Asimov novel, I Robot) was not a typical place to expect a technology start-up to develop. From the beginning, US Robotics saw its greatest strength as being an expert in modem technology. After small and unsuccessful ventures into other realms of the computing industry, the company agreed to focus on developing superior modems for the fast growing computer networking industry. Unlike its competitors, who used integrated circuits as the primary electronics in their modems, US Robotics used microprocessors and developed its own control software to monitor phone noise level and to increase connection speed. Growth came at a rapid pace throughout the 1980's with consistent double-digit revenue increases. Between 1980 and 1984, US Robotics' sales increased from $1.4MM to $21.6MM (1430% increase) and its employee base grew from a mere five people to over 180. In the late 1980's, Robotics' performance continued to improve, despite tough price competition. US Robotics grew through the use of compatible standards along with their top-notch technology, a proprietary DSP-based data pump technology which increased the speed performance of the products. By 1991, sales reached $56.4 million due to the strength of its Sportster modem line. US Robotics held 27% of the global modem market and enjoyed improved profitability during this period as a result of an increase in net margin from 3.6% to 9.6% between 1988 and 1990. Overall, growth potential was strong and sales were expected to jump by 40% in 1992. US Robotics attributed its success in controlling costs to exclusive internal manufacturing in its own plants. Experts attributed USR's ability to control costs to one word: "execution." To help maintain its rate of growth, US Robotics issued an initial public offering of 3.2 million shares of stock in early 1991 (NASDAQ ticker: USRX). USR was ready to expand beyond dial-up modems; it planned to enter the LAN, international bridge and router product arenas. The IPO priced the shares at between $11 and $13/ea. Operations: US Robotics believed that it held strengths in many areas of its operations. Building original technologies and developing acquired ones at its own domestic production facilities was viewed as a unique strength. Since many competitors relied on outside suppliers, US Robotics believed that by maintaining control over the core technology it could get products to market faster, and at a lower cost. In 1994, the firm set up its manufacturing unit as a separate corporate division to improve manufacturing's accountability and efficiency. Head of Operations stated, "At every step of the continuum, we gain opportunities to reduce cost and be first to market. The company's goal is to make its manufacturing process a sustainable competitive advantage". Flat Organizational Structure: "Speed is built into the company's organizational structure," stated VP of Human Resources, Liz Ryan. US Robotics prided itself on establishing a non-hierarchical organization that promoted open communications to ensure rapid knowledge transfer of ideas from the bottom up. As a company it also recognized the contributions and achievements of individual employees. At USR, integration of international operations into global business units and the creation of global revenue goals also improved communication and decision-making processes. Effective Channel Management: Due to breadth of its product line, US Robotics had the widest array of distribution channels in the industry. Representatives regularly visited retailers to help ensure that its products were merchandised effectively and that price changes and promotional programs were implemented on schedule. "It's a key strategic tool," commented Michael Seedman, Marketing Manager. "Our ability to effectively manage our distribution channels is one of our core competencies". Large Product Scope & End-to-End Solutions: Manufacturing products for nearly every point across the communications network was a strategic advantage because it allowed USR to learn from different technologies, to provide complete solutions for its customers, as well as leverage products within the sales channels to maximize distribution. Customer-focused R&D: Complete solutions for customers did not appear by merely having a product for every link in the communications network, but by anticipating and solving consumer needs and having USR's R&D group involved in this process. (An example of this was the development of the popular Xjack modem adapter which provided an easy "pop-out" feature for easy modem plug-in.) Much of the R&D investments at US Robotics were aimed at anticipating and solving consumer needs. For most of its history, US Robotics' primary market had been corporate telecommunications networks where it was the #2 player behind Motorola. But Cowell recognized the shifting perceptions of consumers as traditional electronics became more like consumer products. At the time, USR was not viewed as a consumer products company and did not have any brand awareness with the consumers in this arena. However, in 1993, US Robotics took a bold risk to increase the penetration of high-speed fax/modems into the general consumer market (home office, small business, and entry-level consumers) by lowering prices by 40-50%. Although criticized in the industry for potentially hurting profits, Cowell believed that providing a faster modem (typical performance was only at 24 kilo-bits per second) at a competitive price would provide USR with enough volume to make up for margin loss. Within 16 months of its entry, US Robotics overtook Hayes, the top modem manufacturer, to become the market revenue leader. Profits increased as well. For the first time in USR history, demand outstripped supply, forcing the firm to set-up four additional manufacturing lines that ran 24 hours a day. In 1993, they took advantage of their new market potential and expanded distribution channels to include retail outlets such as Egghead Software, Best Buy and Price Club. In addition, their entrance into the PCMCIA card market was in-part due to their interest in the emergence of Newton as well as the laptop craze that was sweeping the industry. "Technological change is so rapid that you don't have the luxury of doing everything yourself. Sometimes it makes more sense to acquire a technology than it does to develop it in-house. And we've managed to avoid the not-invented-here syndrome. No matter where they originate, we welcome ideas that can help us reach our goals." By 1995, US Robotics had revenues close to $1 billion. Since going public, sales had grown annually at 72%. According to US Robotics, $1,000 of stock invested at the time of the IPO was worth $13,000 in 1995. When they went public, US Robotics had a financial goal to reach $500 million in sales by 1995. This was easily surpassed and USR set an aggressive new goal of $5 billion in revenue by the year 2000. At this stage, an acquisition of Palm Computing was an interesting proposition for the firm. Although not completely on-par with their initial network strategy, Colligan believed that US Robotics recognized Palm as a radical technology to extend their strategy to provide fully mobile network solutions. Living up to its culture of embracing new ideas from wherever they originate, USR gave its newly acquired Palm Computing division the freedom to design, develop and execute launch plans for the product. All 28 original employees of Palm were hired by USR and Donna Dubinsky was made Vice President at USR. Although USR provided advice and relevant expertise in manufacturing and distribution, all distribution decisions and relationships were handled and developed by Palm. In fact, Palm even managed initial product production with Flextronics, a turnkey supplier who had been contracted prior to the USR acquisition. Colligan commented, "Palm had a very strong culture of its own and a very strong product idea engine. Leaving us alone was the best way to help us grow." Palm conducted extensive market research on positioning concepts and industrial design, user interface and functionality, price and user needs. The research findings showed that most people who were excited about the product were PC owners who 1) wanted "mobile connectivity" to their PC when they were away from the office, 2) used a few, simple applications and 3) cared about portability and believed that size of the unit was an enormous usability issue. The most important learning was that "ease of use" was a critical consumer value driver. Consumers did not want every conceivable feature in the product. Palm took this information to heart in the development process. As opposed to the complex-product approach Apple had taken, the vision for the PalmPilot&trade; unit had always been to position it not as a substitute for the computer, but between more powerful personal computers and the much simpler calendar/organizer products that were on the market. In fact, the product was mainly positioned as a simple PC accessory that allowed users to be mobile with the scheduling information already on their home computer. Colligan commented, "Consumer research supported this vision, and the decision was made to stay with simpler features, even as technology improved (fax modems, email, PCMCIA card capabilities)." 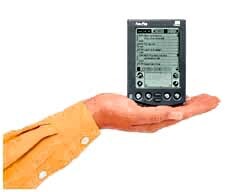 The PalmPilot&trade; was to be a basic features unit with the capability of adding on upgrade features in the future as and when the customer desired. The PalmPilot&trade; was initially launched in January 1996 (only three months after acquisition) and was in full production by March. It was targeted to professional business people who were mobile and were not afraid of new technology and who probably already had a paper or electronic organizer. These were some of the same people who were already buying USR modems. Retailers were initially reluctant to carry the model due to Newton's poor performance. However, USR proved themselves in one retail chain at a time and used each success to gain entrance into additional channels. 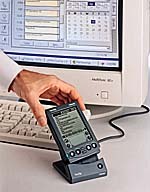 Palm Computing was able to incorporate desktop compatibility into the PalmPilot&trade;, a big breakthrough for this category. Using a docking station, with the push of one button the user could coordinate and back-up data stored on the organizer with a desktop PC. This enabled the user to update files in a personal information manager program that handled appointments and contacts. Overall, the PalmPilot&trade; product succeeded by being the first to hit the bulls-eye in terms of size, features, ease of use, and overall value. Selling over 500,000 in the first seven months and gaining as much as 70% of the hand-held market share, PalmPilot&trade; became the standard in people's minds. It had reached what critics called "the sweet spot", between too many and too few features. Consumers and the trade press congratulated Palm for realizing that size and simplicity seemed to be more important in the market than "bells & whistles". Almost overnight, the PalmPilot&trade; was creating grass roots support among programmers and hackers, something that had not been seen since the early days of the PC. Primarily, the PalmPilot&trade; did not attempt to be everything to everybody. Its success was based on an unconventional idea: to stop trying to replace the PC and instead develop, produce and market a small pocket-sized extension of the PC, enabling the more ordinary and often-required information such as addresses, appointments and phone numbers to be readily accessible in a pocket sized device - and to sell it for less than $400# . This price was considerably lower than competing, albeit more complex, products in the market. A key to its success lay in its ability to overcome the negative impressions in the marketplace associated with the Apple Newton, and by extension, all PDAs. The PalmPilot&trade; did this by ensuring that its handwriting recognition system algorithm, Graffiti, was outstanding in its performance. This included everything from ease of use to accuracy of translation of pen strokes. Reliability was also an inherent part of its 'Hot Sync' synchronization feature that allowed for rapid uploading and downloading abilities with a PC at the touch of a single button. Due to its tremendous success, the third-party software development community supporting the PalmPilot&trade; began to grow. Soon, more than 3,000 developer kits had been distributed as programmers placed bets that the PalmPilot&trade; operating system would become the industry standard. The market for portable computing devices eventually became divided along two dimensions: complexity of features and operating systems. Mirroring the early PC days, the category's foundation lay in proprietary operating systems. First there was the Apple Newton and then, the two other successful products, the PalmPilot&trade; and the Psion Series 3, all of which were proprietary systems. 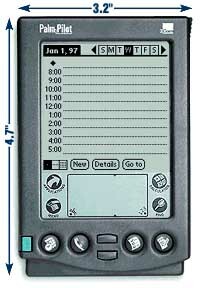 Although the segment was popularized by US Robotics' PalmPilot&trade;, the market gained additional momentum and competition became more pronounced in 1996 as Microsoft introduced the Windows CE (Consumer Electronics) operating system, a Windows compatible operating system developed specifically for the portable computing category. Hardware manufacturers, such as Sharp and Hewlett-Packard, were supporting the Windows CE system for their hand-held units. By mid-1997, Windows CE systems already led the market in terms of total models available. However, the proprietary systems had a grassroots following and were making a bigger impact on the consumer marketplace. Psion was founded in 1980 in England by David Potter who was acknowledged in his home country as an innovative business leader. Potter started his career as an academician working on chaos theory and went into business with an all-or-nothing philosophy. He kept Psion at the cutting edge of technology. In 1984, Psion launched the 'Organizer', a hand-held device with which the company found little market success; but Psion learned from early failure and eventually the inconsequential Organizer and its beta successors proved to be the main engines for Psion's growth during the latter eighties. Success during that period was mainly limited to Europe. In 1989, Psion launched the MC range. Products in this range included the world's very first notebook computer; and in 1991 the massively popular Series 3, which was a combination of the electronic diary, address book and mini-PC in a neatly engineered clam-like box. The Series 3 was much smaller and lighter than the laptop of its day and was positioned as the true notebook. In 1996 Psion was estimated to have sold 30% of the world palmtop volume, at 1.5 million units. The Series 3 ran a proprietary operating system much like MS-DOS and used a miniature version of the IBM keyboard. It had a liquid crystal display and with no internal lighting, it depended on ambient light hitting the display at the correct angle -- this was one of its major product weaknesses. Psion's built-in software comprised a system that allowed multiple programs to be operated simultaneously with data transfer across the programs and had word-processing, file management, time management, spreadsheet work and calculation features. At a price of $399, it seemed a great buy compared to the Newton. One of Psion's differential strengths among all competitors was a much leaner cost structure in manufacturing, boasting an efficient automated assembly line and labor costs at 5% of total costs, compared to 17% for other profitable computer makers. Costs were also kept down through close partnerships with suppliers. All manufacturing was done in London. Psion's avowed position was to remain an independent company even though it saw tough international competition ahead and there was talk of possible mergers. Psion had an ambitious agenda to consolidate and strengthen its position by working to build wireless modems and voice recognition into its notebooks/palmtops. Microsoft was counting once again on consumers' familiarity with its desktop software. Windows CE had many of the same features as the company's Windows 95 operating system, and the PDA-like devices that used this system came with simplified variants of Microsoft's PC programs, such as Microsoft Word. This system had the obvious advantage of providing complete compatibility with all traditional Microsoft products and operating systems. However, competitors at Palm and other companies believed that the Windows heritage led to overly complex software and bulky hardware, which was out of step with users' needs. While laptop computer owners often switched-on their machines for hours at a time, a hand-held device was expected to be on for just a few seconds to find a piece of information. In that environment, users weren't likely to tolerate a system that took more than a few seconds to run. Microsoft's strategy of adapting its popular Windows system to the new tiny hardware platform did not impress many analysts because it was too expensive and tried too hard to emulate PCs. In addition, these units had inferior screens and cramped keyboards. Not only did major hardware vendors sign deals to create Windows CE devices, but the third-party software development community took interest because they already knew how to write applications for Windows. The same tools that were used for the traditional Windows desktop environment were applicable to create programs for CE device. This meant plenty of programs for the CE-based brands. Microsoft was already working towards using CE in a whole new category - "ultra-ultra portable" computers. As of mid-1997, the leading proprietary operating systems still had a stronger community of users and an active software development base compared than Windows CE-based systems. This enabled users to find multiple add-on features and software to personalize their units to be as simple or as complex as they wished. The Windows threat had not yet become a danger. The 620lx HP color palm top using the Windows CE operating system was Hewlett Packard's 1997 offering in the hand-held computer market place. Hewlett Packard company was started in 1939 by two classmates from Stanford University, Bill Hewlett and Dave Packard. Ever since, HP had been a pioneer in several areas of technology and created more than 25,000 products from areas including computers, peripheral devices, test and measurement instruments, chemical analysis, and handheld calculators among others. The 620 lx was an improvement on the 320lx which was the most successful among the Windows CE systems. A senior HP marketing manager claimed their newest palmtop PC would solidify "its place in the corporate enterprise and in the hands of mobile professionals." The Sharp Corporation was founded in 1912 in Japan by Mr. Tokuji Hayakawa. In 1962, Sharp Electronics Corporation was organized in New York as the U.S. subsidiary of Sharp and is known for innovative products in various areas like consumer electronics, liquid crystal display, imaging, and laptop computers among others. Sharp offered the widest product range -- four different lines, all of which used the Microsoft Windows CE 2.0 operating system: the Mobilon, the Mobile Organizer, the Wizard and the Zaurus. They differ in terms of the synchronization capability and features -- some had stripped down versions of popular scheduling, personal organization, word processing, spreadsheet and presentation software. While HP made a dent in the hand held computer market, Sharp had not yet been as successful. Colligan felt that US Robotics had just scratched the surface of the hand-held market. With the Internet and network connectivity becoming more important to consumers, Colligan believed they could build PalmPilot's reach and maintain this advantage. However, the question was whether they could continue to judge the market correctly and maintain this advantage. Of course, the Microsoft sleeping giant was what worried them the most. US Robotics was faced with many options to pursue in an effort to grow revenues and gain stronger market footing against them. Opportunities to partner with technology firms such as Symbol, a global leader in wireless data transactions and bar coding, and the IBM contract could be one alternative. Colligan cautioned, "It would be bad to lose focus and get distracted. There is a huge market of people who just want a great tool to be more organized." But, at the same time, he knew it was vital that they continue to be aggressive and grow. "We are working on pushing the areas (of communications integration) and you will see us continue to innovate in incredible ways to maintain our leadership position." "How Palm Computing Became an Architect", by Carliss Y. Baldwin and Kim Clark detailing facts included in Myra Hart's Harvard Business Case, "Palm Computing, Inc. (A)", HBS Case number 396245. Harvard Business Review, September-October, 1997. PalmPilot Professional Edition (1MB): 4000 addresses, 2400 appointments, 750 items, 750 memos and 100 emails. Import and Export Formats: CSV, Tab delimited, and TXT. IBM-compatible 386 or higher, Windows 95, Windows 3.1x, Windows NT 4.0, Windows for Work Groups 8 MB RAM minimum (16 MB RAM recommended). Requires PalmPilot MacPac, 68040 or PowerPC, 12MB RAM, System 7.1 or later. **-For 1996, issuance of common stock includes tax benefits relating to exercising stock options. Technology related to ISDN and Frame Relay-based client and server products. Manufactrures & sells ATM switches that target WAN & LAN environments. vote FOR approval and adoption of the merger agreement. and for the creation of significant long-term stockholder value. merger that we believe will contribute to the success of the combined company. -By combining the complementary product lines and technologies of U.S.
consumers--for end-to-end connectivity across both LANs and WANs. products through the other's key channels. hubs, remote access servers and concentrators, NICs and high speed modems. expenditures of $500 million at current levels. the leadership of 3Com's chairman and CEO. deliver significant long-term value to our stockholders. strongest possible company as an ongoing source of long-term shareholder value. networking industry, we believe that there is no better partner for U.S.
Robotics than 3Com and no better time to do this transaction than now. special meeting. Your prompt cooperation will be greatly appreciated.